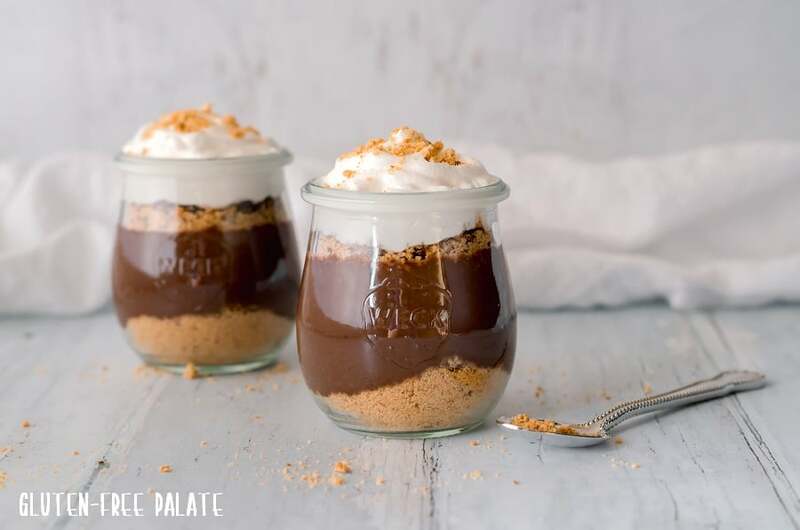 Gluten-Free S’mores Parfait – a simple, yet decadent gluten-free dessert with layers of graham crackers, homemade chocolate pudding and whipped cream. This recipe for Gluten-free S’mores Parfait is sponsored by Schar. Opinions are my own. S’mores are a traditional campfire treat consisting of a roasted marshmallows and a layer of chocolate sandwiched between two graham crackers. They’ve have been around since the early 1900’s bringing enjoyment to chocolate-lovers alike. We’ve always enjoyed s’mores while camping. 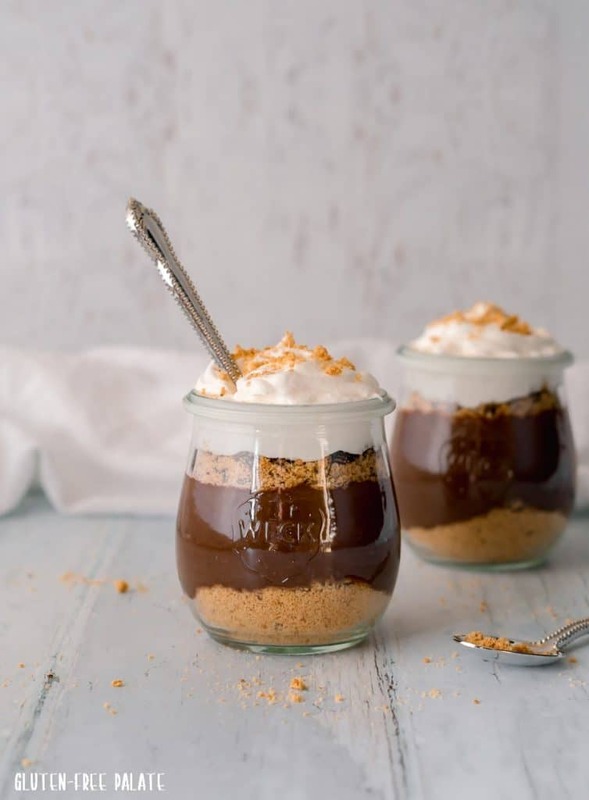 More recently we have been seeing recipes for s’mores cookies, cakes, cupcakes and mini s’mores cups, bringing the famous and enjoyable dessert casually to meal time without the need for a campfire. But how about a s’mores parfait? Why not – it’s simple enough and you get all the decadent flavors and enjoyable textures without the mess. The wonderful thing about a Gluten-Free S’mores Parfait is that you can make it anytime of year, and you don’t need to build a campfire. In fact, these are no bake. 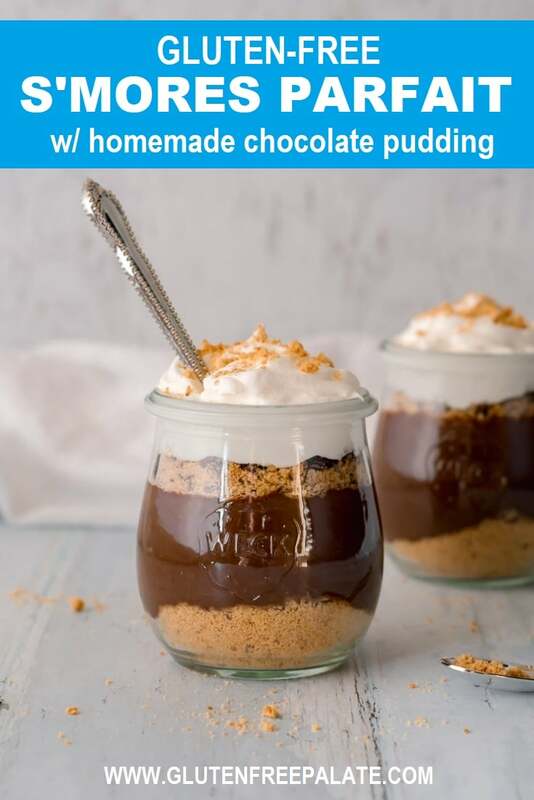 While they don’t have marshmallows (although you could use marshmallow fluff in this recipe) they are still a superior treat and definitely mimic the traditional s’mores flavors. This recipe for S’more’s Parfait is easy and elegant. It uses Schar gluten-free graham crackers as the base. Top the crumbled graham crackers with chocolate pudding and some whipped cream and you have yourself a delight full treat. You could make them in 8 oz plastic cups for a more casual appearance, or you could assemble them in glasses like I did hear and really dress them up. 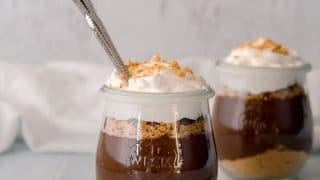 And if you want you can do multiple layers, or top these Gluten-Free S’mores Parfaits with chocolate or additional crushed graham crackers. 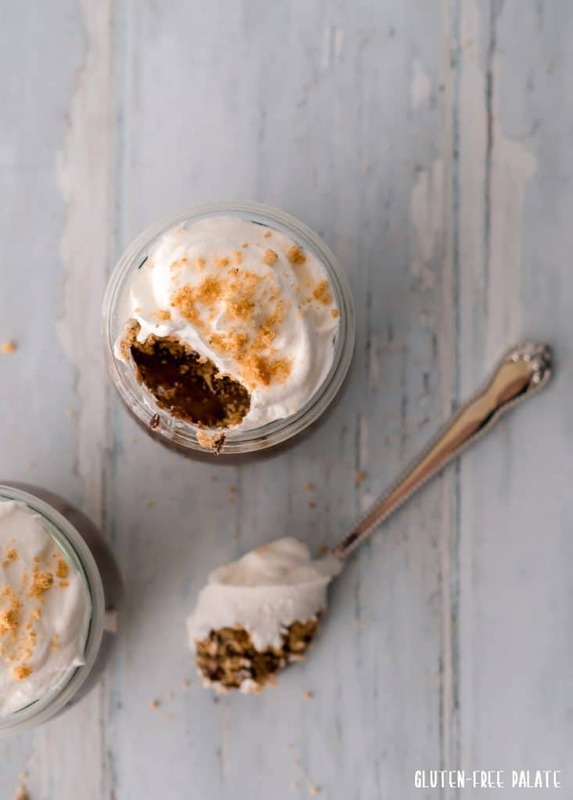 One of the many things I love about these Gluten-Free S’mores Parfaits is that they are single serving desserts. This recipe makes a small batch that serves 4 people. BUT, if there is only one of you (or two), you can refrigerate the leftovers to for another night. Gluten-free S'mores Parfait - a simple, yet decadent gluten-free dessert with layers of graham crackers, chocolate, and whipped cream. In a medium saucepan over low heat, whisk together sugar, cocoa, cornstarch, salt, and milk. Whisk constantly, until mixture boils. Boil for one minute then stir in butter and vanilla. Remove from the heat and let sit until it reaches room temperature. Spoon crushed graham crackers evenly into 4 serving bowls or jars. Once pudding reaches room temperature, spoon pudding over graham cracker layer. Top with whipped cream, or coconut whipped cream. If desired, sprinkle on crushed graham crackers. Yes! It would be awesome with their chocolate honey grams too! YES!!! The layers are so pretty! I love the whipped cream on top, such a nice touch. I think coconut whipped cream would be delicious with this recipe. I’m so glad you came up with this recipe! It’s genius and I can’t wait to make it soon! Those Schar graham crackers make a perfect crust or crumble . My kids would love this. This would be a lot less mess than s’mores. This dessert is irresistible. I love all the textures. I’m so used to baking from you Chrystal, but you’ve been rocking the pudding recipes lately! This looks creamy and blissful.